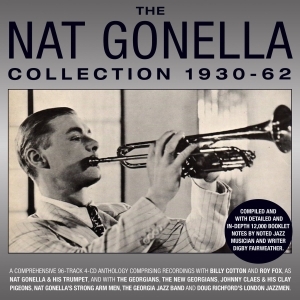 Trumpeter and bandleader Nat Gonella was the first real star of British jazz, beginning his career with the bands of Billy Cotton, Roy Fox, Lew Stone and Ray Noble in the early 30s before forming his own touring band ‘The Georgians’ in April 1935. Playing in the style of Louis Armstrong, he became a headlining concert attraction in the UK, recording two singles a month after he signed to EMI’s Parlophone label in 1935. In 1939 he was one of the first British jazzmen to visit the USA, where he recorded and performed with major names of the era. He subsequently led his big band, the ‘New Georgians’, through much of the 1940s and when traditional jazz experienced a boom in popularity during the later 1950s formed his ‘Georgia Jazz Band’, participating in the music’s new-found popularity as one of its elder statesmen until 1963. In later years he continued performing in Britain and Europe until his death in 1998. This great-value 96-track 4-CD set, marking the 20th anniversary of his untimely death (as well as the 110th anniversary of his birth), has been compiled to provide the first comprehensive overview of the first three decades of his career. It has been researched by celebrated British jazz cornetist and writer Digby Fairweather, who has written the 12,000-word booklet to annotate the anthology. The collection includes recordings with Billy Cotton, Roy Fox, all of Gonella’s principal recordings (both solo and with his Georgians and New Georgians), rare broadcast materials and long-unheard reissues of later 1950s sessions by his Strong Arm Men, Georgia Jazz Band, Doug Richford’s London Jazzmen and his full (and long-deleted) ‘Autobiography’ album ‘The Nat Gonella Story’ from 1961. It provides a thoroughly entertaining showcase for one of the great personalities of British jazz who was one of the true pioneers of the genre on this side of the pond.